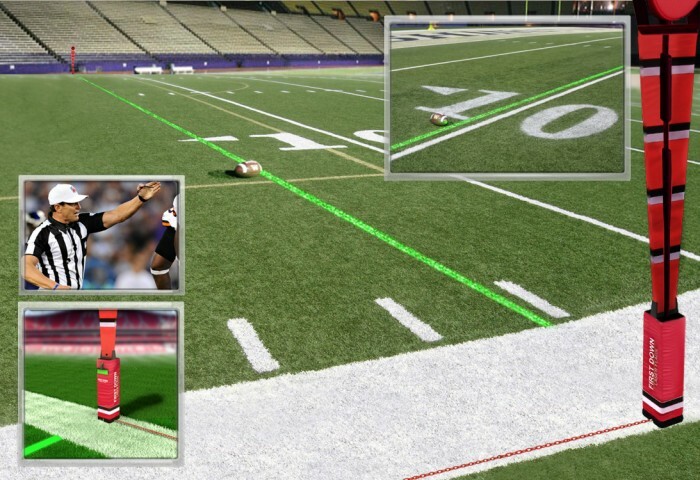 First Down Laser Systems, the in-stadium graphics designer that puts the first down line on the field in the stadium for all to see, is readying its demonstration models for trials with eager customers and the Sports Techie community blog is excited about this happening sooner than later. The ‘green line’, used so successfully at the NCAA Outdoor Track and Field Championships in June, could revolutionize the way football is played, watched, and officiated. 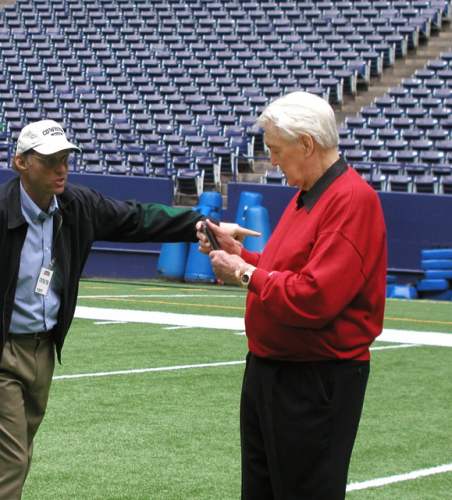 Legendary sports broadcaster Pat Summerall was someone I believe to be full Sports Techie at heart as his partnership and product endorsement of First Down Laser demonstrated to all. Catch up this sports tech company Founder, Alan Amron, in New York at Super Bowl 48 broadcasted nationwide on NFL on Fox Sports in HD and for free by using the FS Go app. Pat Summerall was the original John Madden for many senior aged NFL fans that are alive today. When he spoke about broadcasting, the sports Industry listened because of his years of broadcast experience at the highest levels which meant he was always on the cutting edge of the newest tech bells and whistles his TV and radio employers would introduce to football fans in the United States and abroad. In this exclusive video below, Pat discusses the history of First Down Laser Systems, its features and benefits. Pay attention to the end when he mentions how this sports tech product can earn hundreds of millions of dollars in advertising and sponsorship revenue. Currently, home viewers see a yellow line on television that marks the first down (or line to gain, in football parlance). But that line does not appear on the actual field, and neither players, coaches, nor paying customers get to enjoy it. 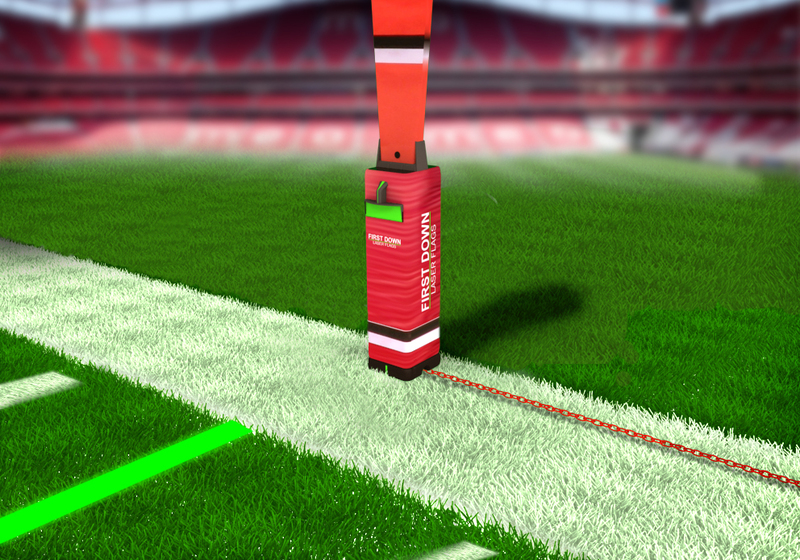 First Down Laser, with its end-zone projector and laser-embedded yardsticks, brings that technology to the field. TIME FOR NFL TO EMBRACE LASERS TO MARK FIRST DOWNS? USA TODAY Newspaper article 12-3-2013 sports section back page on FirstDownLaser use in the game. Should Lasers Replace the NFL’s Chain Gang? First Down Laser on Bloomberg TV Taking Stock – reported: segment video link click here. There are (3) three patented (and or patents pending) suggested ways to accomplish projecting our first down laser line onto a playing field. Please contact Alan @ (305) 343-7480 – or by reply email here. Sports Techie, I enjoy blogging about Alan’s efforts promote the First Down Laser Systems as the sports technology solution that now needs it’s moment in time to change the game of football for the better just like investor and spokesperson Pat Summerall felt it would do before he passed on. It really is a no-brainer for the NFL and NCAA to install this system or something like it that improves upon human officiating by automatically marking first down lines with a green line so everyone on the field, in the booth and on TV, can see this critical part of the game the same way. The ball can also be marked and identified so when 3,000 pounds of football player are packing into a pile at the goal line and no one can see where the ball is, there is a proven option to go to. The Fox Sports production crew has double figure cam angles to analyze at their disposal, cameras that use super slow-mo instant replay, and pan, zoom and tilt functionalities, but all that sports tech together is not as sure a thing as First Down Laser. Last year 3 million unique online viewers watched the CBS Sports live stream of Super Bowl47. Nielsen data indicates 53 million homes and 108.7 million U.S. viewers watched a year ago. You can bet the new Apple iPad Air that SB48 will set a new mobile device record as more digital device using NFL and Super Bowl fans than ever before are expected to engage with SB XLVIII. Watch the Big Game on an iPad tablet, desktop computers and laptops with the Fox Sports Go app or on your browser at FoxSportsGo.com. The live web stream will be available free to anyone with an Internet connection beginning at 9 a.m. PST on Sunday, Feb. 2, and will also include seamless access to the NFL Spanish-language broadcast. In order to watch the big game live on your smartphone you have to be a Verizon customer and spend $5 per month for the premium version of the NFL Mobile app which is worth it. According to Fox, “What doesn’t work so well with any live streaming option is trying to use it as a “second screen” alongside a live TV broadcast. Because of the technical necessities of putting a live signal online — which includes mainly taking the TV feed and encoding it to the Internet — delays between “live” TV and the show online can be from 20 seconds to a minute or more.” When this delay happens on your second, third and fourth screens, it would be nice to know the green line is operating in real-time on the field while you catch up with the commercials. Getting rid of the extra point and using instant replay to give penalties for unsportsmanlike penalties are wonderful concepts for implementation over the next several years but the First Down Laser System needs to be implemented yesterday or today in order to be ready for the last game of the 2013 season next Sunday. It would be nice to know the league and officials are in first down laser synch with the Fox Sports production crew during Super Bowl 48 at MetLife Stadium in New Jersey between the Seattle Seahawks and Denver Broncos. We all know that will not be happening so the 2014 NFL season it is. I am personally rooting for the hometown Hawks and will be watching every play for the proper ball placement and first down measurements in hopes that these best of the NFL playoff officials do not mess it up because they are after all human and we do make mistakes. Only these fixable mistakes can cost an organization, any of you postseason fantasy football players, and Super Bowl 48 gamblers, a Super Bowl championship, Lombardi trophy and player rings, plus whatever it is you have a stake in to win. It simply does not have to be that way using First Down Laser, right Pat.